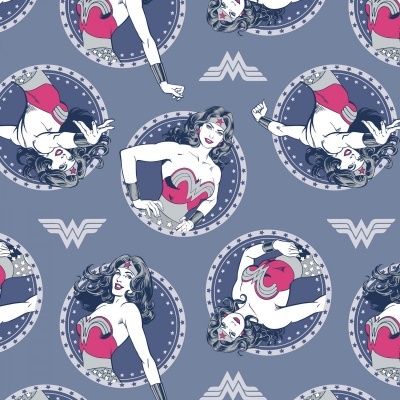 Wonder Woman design on a blue background, 100% cotton from the Camelot Wonder Woman cotton collection. 112cm / 44" Width, this fabric weighs approximately 160gsm. Multiples of a size will be cut as one piece unless requested otherwise. Camelot Fabrics is a Canadian company specialising in striking 100% cotton prints that include a unique range of licensed cartoon and super heroes prints from Star Wars, Batman, Superman and Warner Brothers.